Tonight’s full moon is the second this month and skywatchers can not only look forward to a ‘supermoon’ but also to a full lunar eclipse. The moon was at its closest to the Earth (at ‘perigee’) last night and will be at its fullest tonight. 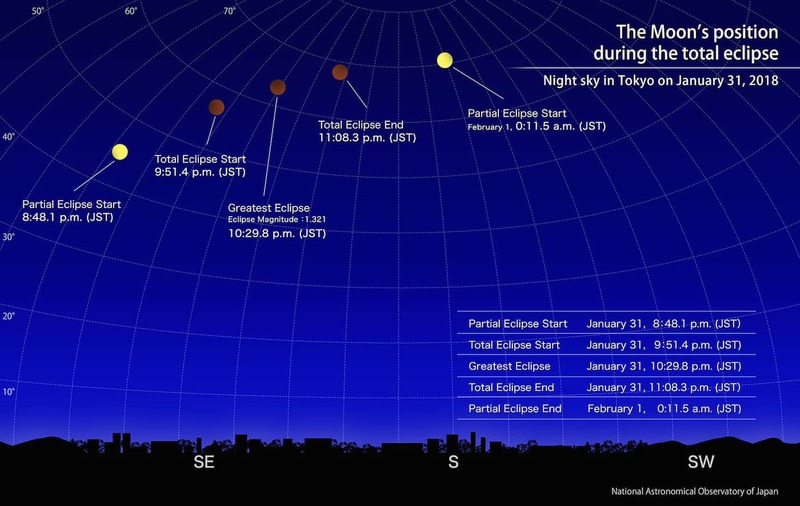 The whole of the total lunar eclipse should be viewable, start to finish, from all over Japan and totality will last a whole 77 minutes. Clouds permitting, we should be able to view a a red copper colored moon during totality with naked eye or with the aid of a telescope or binoculars. Image: National Astronomical Observatory Japan. Click to view larger. With the second full moon within a single calendar month being called a ‘blue moon’, tonight we have the pleasure of (hopefully) seeing a rare cosmic trifecta that National Geographic calls a ‘Super Blue Blood Moon’ for the first time since 1982.